Spectroscopy is used in physical and analytical chemistry for the identification of substances through the spectrum emitted from or absorbed by them. The derivation of structural information from spectroscopic data is now an integral part of many courses in chemistry and related subjects at most universities. Features exercises to help develop the student's understanding of how structures are determined from spectra and to promote the student's own interpretation of different spectra. Covers a large range of spectroscopic data, including mass spectrometry, infrared and 1H and 13C nuclear magnetic resonance, typically used in the routine analysis of small-sized organic molecules. Presents in full-color, in a workbook-friendly format the spectra for interpretation with explanations and analyses on the facing page. 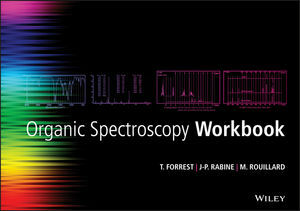 Related to the workbook the authors have an online resource of the problems featured in the workbook, available at: htttp://spectros.unice.fr/ By using the print edition alongside the online spectra, students will be able to enhance their understanding of the interpretation of multiple spectra.